Although I would argue for the Savage vs. Steamboat WM3 match as the greatest WM match. My first experience watching wrestling was WM 5 live on PPV. I was only 5 years old and I watched it with my older sister. I was hooked (I mean religiously hooked) to all 3 companies from that point until the mid 2000s. I could think of a few I'd put before Austin/Rock as well. Obviously Steamboat/Savage, but Bret Hart alone has had some matches that topped it in my opinion(vs. Owen WM10, HBK WM12 and Austin WM13). HBK has also had some tremendous matches(ladder match at WM10 and the Undertaker matches). Another good match that flies under the radar is Savage/Flair from WM8. As much as I loved watching both Austin and The Rock, I never cared for the ending of WM17 with all the chair shots and the horribly executed heel turn. Wow, your experience sounds almost exactly like mine. I also started watching at Wrestlemania 5, also at age 5 and with my older sister. The only difference is, I kind of gave up on it a little earlier. I was pretty much done by the start of 03. You could see an almost immediate decline after WCW was bought out. Also, guys like Angle/Lesnar just never did much for me. In my opinion, the eras of 88-92, and 97-01, will never be topped. Or at least not any time soon. I agree with your two eras, except that I would add 1996 into your second time period simply due to the formation of the NWO and the huge impact that it had on all of pro-wrestling. One of them. He used to ooze machismo, now he's just... uh... oozing. Watch the ESPN documentary on Hall. 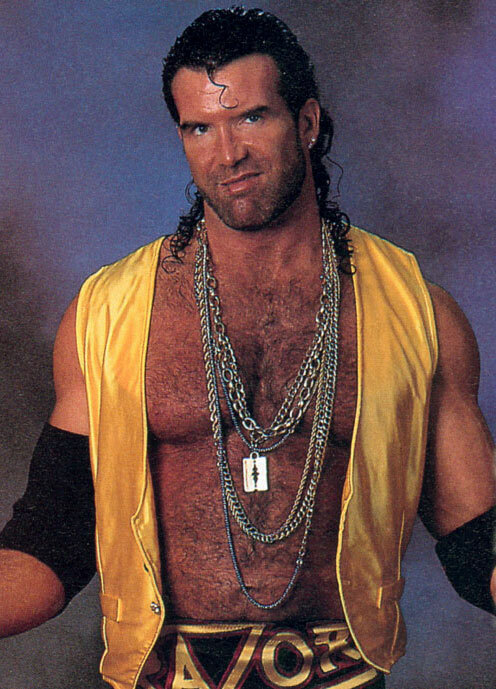 It's a sad reality that Scott Hall became a victim of his own success. I've seen it. Excellent documentary. Awful that he actually had to live the story. In all the years that I have watched professional wrestling, this was my NUMBER ONE mark-out moment. I remember reading rumors that Taker was set to return in some fashion at or around Judgment Day. Well, the American Badass made his return and cleaned house in typical Taker fashion. After having been a Taker fan for so many years, it was strange to see him on a bike and in a trenchcoat. But damn, XPac could sell a chokeslam cause he weighs 100 pounds soaking wet. What a moment. Now the Austin interference at Backlash the month prior was fun cause when you hear that glass shatter you get up. But you can see how stiff he is delivering chairshots. You've gotta believe he wanted to deliver stunners so hard to everyone in the ring. Austin as a goofball never did it for me either. Once he went heel and did the routine with Vince backstage, I laughed, but I didn't feel like I wanted to laugh at Austin. He wasn't a comical guy. He was the Baddest SOB on the planet so why am I laughing at the Texas Rattlesnake? Right after the Invasion PPV I seriously lost interest. I got back in when I heard that the NWO were coming in but Vince botched that whole thing royally. In fact, the purchase of WCW and the use of their wrestlers was a joke. Goldberg was the man everyone wanted to see but his contract was ridiculous so Vince let it expire rather than buy him out(same with all the NWO members). In fact, Kevin Nash is to blame when you think about it since he demanded that whenever anyone came in and got a salary higher than his, Turner would have to match it. Instead of instantly buying up all the properties of WCW, as the contracts were owned by Time Warner, Vince let them expire but it was too late by the end of 01 and beginning of 02. The Invasion angle was an absolute failure, but I think deep down Vince never wanted to allow WCW stars to have serious screen time with great success. He wanted to portray them as weak, otherwise how in the world could you legitimize the strength of WWF superstars week after week? Oh well, I remember the dream match ups my friends and I came up with after WCW was purchase. 3D SuperBall Champion! Diamond Mine Champion! mahjong Champion! Mario Tetris 3 Champion! Snipers Champion! Sonic Champion! Tetris Champion! Torino 2006 Ice Hockey Champion! Zelda Champion! The Invasion angle was a disaster. What's sad about it is that the angle pretty much created itself. But like Gary said.. at the end of the day, there's no way Vince was going to let the WCW guys get over in a big way. Yea Invasion was horrible. Except for a show in Providence I went to where Stone Cold stunned about 20 alliance guys. It was epic. The Invasion storyline was the beginning of the end for the whole industry. I truly miss the Monday Night Wars. Looking forward to CM Punk and Jericho tonight. Is there anywhere that you can catch the PPV online? I'm watching channel three now. I never knew this site existed, so I'll have to bookmark it.